The media has been set ablaze with chatter about what went down after last week’s season 44 premiere of Saturday Night Live. Last minute musical guest Kanye West ended the show with a performance featuring rapper Kid Cudi and singer 070 Shake, but it was his politically charged rant that went on directly afterward off-air that got the media talking. Sporting a MAGA hat, or his “superman cape” as he referenced it, the speech touched on points like liberal bullying and the media being run by Democrats. The speech was met with boos from the audience and members of the SNL cast visibly rolling their eyes while being forced to stand behind him. 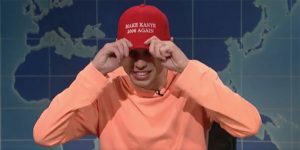 The anticipation has been high as to how the sketch comedy show would address the matter during this weeks episode, but it wasn’t until Pete Davidson made his appearance on the “Weekend Update” segment with Colin Jost and Michael Che that they did just that. Both men have found themselves heavily talked about in the media as of late with a series of bizarre pro-trump antics from West and Davidson’s very high profile engagement to singer Ariana Grande. West has not responded as of yet but has notably deactivated his Twitter and Instagram accounts.